Headlines in the space news world will talk about Masten coming from behind with only minutes to spare to beat Armadillo. See the details. Also here for Jonathon Goff’s comments. LROC continues with spectacular views of the Moon. Frozen Impact Melt on the far side of the Moon. A NASA press release announced the upcoming transfer of the Tranquility pressurized module from the the European Space Agency to NASA. Tranquility will provide room for many of the station’s life support systems. Attached to the node is a cupola, a unique work station with windows on its six sides and top. The module will be delivered to the station during space shuttle Endeavour’s STS-130 mission, targeted for launch Feb. 4, 2010. The JAXA HTV-1 resupply spacecraft is set to depart the ISS with the latest garbage dump and burn up in the atmosphere. NASA is working to recover the Ares I-X first stage. One of the three parachutes collapsed, and the lower segment of the rocket buckled, possibly on impact with the ocean. BOOM. Two teams report in Nature on a gamma-ray burst that occurred a mere 630 million years after the Big Bang (that’s 13.1 billion years ago). It is the youngest gamma-ray burst ever seen. The previous youngest burst happened 825 million years after the Big Bang. LROC unveils Apollo 17 landing site. Great resolution. The most distant object in the universe. Give credit where credit is due. NASA launched its first new rocket in thirty years. Successfully. Lots to be learned from the data. Cheers. “Ruh Roh”. Mars Reconnaissance Orbiter is still in “Safe” mode after six weeks. Engineers are now working to create a safeguard against that worst-case scenario as well as finding the cause of the mysterious voltage signals. The scrubbed launch of Ares I-X is now scheduled for launch on Wednesday. There is a four-hour launch window, extending from 8 a.m. until 12 noon EDT. See NASA TV. The number of close encounters between objects in orbit will rise 50 per cent in the next decade, and quadruple by 2059. Countermeasures will add greatly to the cost of future missions. Following the announcement of a hole on the Moon into a sub-lunar lava tube (see below 23 October), comes the announcement of a similar find on Mars. Glen Cushing, a physicist with the US Geological Survey, discovered the series of “collapse depressions” in extinct lava flows from a Martian volcano. NASA publishes a list of upcoming launches. In a case of being in the right place at the right time, the MESSENGER spacecraft was able to capture an average-sized solar flare, allowing astronomers to study high-energy solar neutrons at less than 1 astronomical unit (AU) from the sun for the first time. The Ares I-X is scheduled for launch on Tuesday. There is a four-hour launch window, extending from 8 a.m. until 12 noon EDT. If weather scrubs Tuesday’s attempt, the launch team will try again on Wednesday, maintaining the same launch window. Jeff Foust has a discussion about political and other perspectives of the Augustine Commission Report on The Space Review. “A plethora of boulders surrounds braided flows of impact melt along the inside wall of crater Epigenes A.” Latest LROC image. Neat images on Astronaut Nicole Stott’s Blog. Follow NASA on your iPhone with the NASA App. The App delivers up-to-the-minute NASA content directly from Agency sources in one easy-to-use mobile platform. Interested in the missions to Mars over the past 50 years? Check out this poster. Two ESA satellites are set for launch on 2 November 2009 from the Plesetsk Cosmodrome in northern Russia. SMOS will provide the data to produce global maps of soil moisture at least every three days and global maps of sea-surface salinity averaged over 30 days. Proba-2 incorporates a total of 17 technology developments and four scientific experiments that focus on solar and space weather. A deep hole on the Moon that could open into a vast underground tunnel has been found for the first time. NASA has begun to shift focus toward longer range research in technology. Final report of the Augustine Commission. Conference on Women in Astronomy and Space Science 2009 (21-23 October). The New Scientist rates the five options of the Augustine Commission. NASA rolled out the Ares I-X rocket to the launch pad early this morning. Ames Research Center has announced the winners of the Regolith Excavation Challenge, held on Oct. 17-18, 2009. Competitors were required to use mobile, robotic digging machines capable of excavating at least 330 pounds of simulated moon dirt, known as regolith, and depositing it into a container in 30 minutes or less. The winning excavator lifted 1,103 pounds within the allotted time. The Orionid Meteor Shower will be in full swing tonight. Observers in the Northern Hemisphere will see around 20 meteors per hour at maximum, while observers in the Southern Hemisphere will see around 40 meteors per hour. Best viewing is thought to be around 3:00 AM Phoenix time. The Augustine Commission is expected to release its final report on Wednesday, 21 October 2009. On Monday, Oct. 19 at 3pm PDT, Mr. David Thompson will join Conrad Foundation’s The Exchange webinar to discuss his thoughts on what innovation means for the Aerospace Industry, and the AIAA winners of Aerospace Exploration and Space Nutrition challenge categories. Registration is open to the public. It is expected that approval of the Range Safety waiver for the Flight Termination System on the Ares I-X rocket will be granted. The United States Air Force launched its latest Defense Meteorological Satellite Program (DMSP) F-18 Block 5D-3 spacecraft. The DMSP is used for strategic and tactical weather prediction to aid the U.S. military in planning operations at sea, on land and in the air. The DMSP marked the 600th launch of an Atlas vehicle, carrying on a program that began with the first Atlas A rocket launched from Cape Canaveral Air Force Station, Fla., in 1957. Sometimes progress is fast, but the results are slow coming to light. Hubble observations taken Dec. 9 and 10, 2005, showed Xena’s diameter as 1,490 miles (with an uncertainty of 60 miles), while Pluto has a diameter of 1442 miles. That makes the “tenth” planet the ninth largest. NASA has released this Cassini image of Janus, one of the moons of Saturn. NASA has released the first all sky map from its Interstellar Boundary Explorer (IBEX) spacecraft, showing the solar System’s interaction with the Milky Way’s interstellar medium. The 2009 Regolith Excavation Challenge Oct. 17-18, with a $750,000 prize, will pit 23 teams using robots they designed and built to excavate simulated lunar soil. To qualify, a robot must dig up at least 330 pounds of regolith and deposit it into a container in 30 minutes. ESA astronaut Frank De Winne took over the command of the International Space Station – the first non-American and non-Russian to take on this role. Spectacular fireball over the Netherlands. The Planetary Society has the latest Mars rover updates for Spirit and Opportunity. European Space Agency (ESA) reports that an Engineering Test Unit (ETU), a test model of ESA’s Near-Infrared Spectrograph (NIRSpec) for the James Webb Space Telescope has been completed and will be shipped to NASA. Robert Bigelow’s open letter to NASA Administrator Charles Bolden about commercial cargo and crew launch. From the Orlando Sentinel: “People are very worried [our] efforts are a threat to Constellation rather than an enabler,” says Ken Bowersox, a former astronaut hired by Space Exploration Technologies (SpaceX). “We don’t want to compete like that. We want to enable. We want to provide a cheap way to get to station so you can spend money to do the exciting exploration things”. Liberate the NASA exploration program from mundane tasks. 2009 Regolith Excavation Challenge. Another prize – $750,000 on October 17 and 18 at the NASA Ames Research Park at Moffett Field in Mountain View. Here is an interesting piece by Brian Horais called “The Emperor needs new clothes”. Arizona State University has just released a new set of high resolution images of the Martian surface. 222 images are in the most recent set. National Geographic “Map of the Day” – 50 Years of Solar System Missions. The Hubble Space Telescope was focused on the Moon Friday morning when the LCROSS Centaur stage and the shepherding spacecraft impacted the Moon. 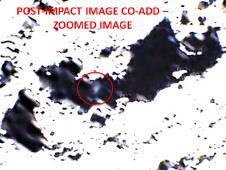 There was no immediate indication of the impact and additional processing is expected. The 60th International Astronomical Congress will be held this week in Korea. NASA Administrator Gen. Charles Bolden will attend, although he has expressed his trepidation about being abroad when the Augustine Commission releases its final report. A Russian cosmonaut, an American astronaut and the world’s first space clown departed the International Space Station and returned to Earth, winding up their expeditions to the orbiting outpost. ESA (European Space Agency) astronaut Frank De Winne has become the first European commander of the International Space Station this weekend. The current commander Russian cosmonaut Gennady Padalka has left the ISS on board Soyuz TMA-16. Mars rover Spirit is in day 2049 of it 90 day mission and Opportunity is in day 2028 of its 90 day mission. Both are well outside their warranty date. Spirit has traveled 7,729.93 meters, and Opportunity has traveled an incredible 17,962.44 meters. ESA (European Space Agency) Director-General Jean-Jacques Dordain told the 18-nation agency’s ruling council he expects to finalize an agreement with NASA by mid-November for a 2016 launch of a 600-kilogram ESA lander that will include exobiology experiments, and a 2018 mission. NASA will supply two Atlas V rockets and will feature ESA’s rover deployed to the Mars surface by the same Sky Crane system — with the rover, attached by chord to the descent module, gently lowered to the surface — that NASA plans to use for its large Mars Science Laboratory rover to be launched in 2011. The LRO Diviner instrument obtained infrared observations of the LCROSS impact this morning. LRO flew by the LCROSS Centaur impact site 90 seconds after impact at a distance of ~80 km. Space Daily that the ocean on Jupiter’s moon Europa contains enough oxygen to support life. Prepare for the LCROSS impact on the Moon. Live NASA web coverage at 6:30 AM EDT, Friday (Yes, that’s 3:30 AM Phoenix time). Impact is at 4:31 AM Phoenix time. The New Scientist reports that while Apophis is less likely to impact the Earth in 2036, 2068 is looming as a threat. NASA has released the refined orbit of the asteroid APOPHIS. The risk of its hitting Earth in 2036 has been reduced dropped from one-in-45,000 to about one-in-250,000. Masten Space Systems completed their Level 1 flight in the Lunar Lander Challenge and are awaiting a final ruling by the judges. All looks good. NASA’s Spitzer Space Telescope has found a GIANT ring around Saturn. GIANT. ITAR reform is needed to expand U.S. exports and competitiveness. Boeing and Energia have announced plans to build a future common docking system. Dr. Steve Squyres (Cornell University) has been awarded the Carl Sagan Medal by the American Astronomical Society for his work explaining the Mars Exploration Rover mission to millions of people. SpaceX has announced completion of acceptance testing of both the Falcon 9 first and second stages in preparation for the first flight of Falcon 9. Opportunity, one of two Mars rovers and now in its fifth year of a 90 day mission, has discovered another meteorite on the Martian surface. Dr. David Livingston’s The Space Show – “The Monday, Oct. 5, 2009, 11 AM-12:30 PM PDT Program is the special AIAA/Space Show Augustine Commission panel discussion featuring Bob Dickman, “Doc” Horowitz, Frank Culbertson, John Klineberg, Elliot Pulham, and Harrison Schmitt.” Listen Live. Today is the 50th anniversary of the launch of Luna 3, the first to photograph the lunar farside. Details of Luna 3 are here. The Star Wars in Concert has performances at 2 PM and 7 PM today, Sunday. 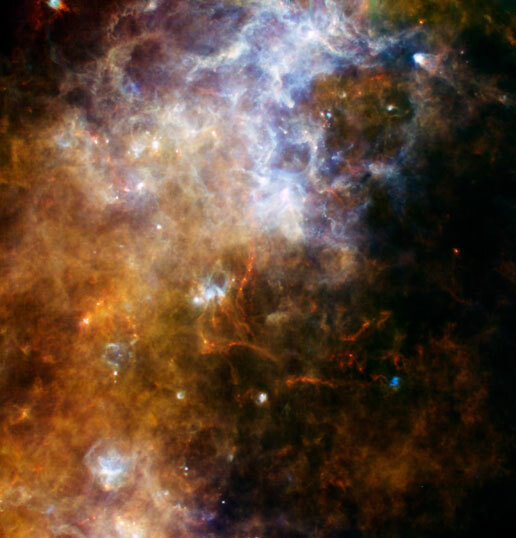 NASA has released the latest images from the Herschel Infrared space telescope. One of the images “reveals a cold and turbulent region where material is just beginning to condense into new stars. It is located in the plane of our Milky Way galaxy, 60 degrees from the center. Blue shows warmer material, red the coolest, while green represents intermediate temperatures. The red filaments are made up of the coldest material pictured here — material that is slightly warmer than the coldest temperature theoretically attainable in the universe”. Check in with Phil Plait and his observations at Bad Astronomy. The European Space Agency (ESA) continues work on the Advanced Re-entry Vehicle. The vehicle is large enough to eventually give ESA access to the International Space Station for a crew of four. The World at Night exhibition at Christown Mall in Phoenix. SpaceNews.com reports that the White House has asked that $670 million be restored to NASA’s Human Space Flight budget. Read the Tea Leaves. Tickets go on sales this morning for Star Wars in Concert in Phoenix. The Soyuz spacecraft docked with the International Space Station at 1:35 AM Phoenix time today, Friday, after executing a rendezvous burn Thursday. 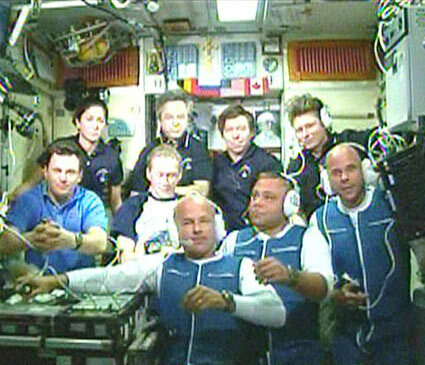 Image of the combined members of expedition 20 and 21. A German team – c-base Open Moon Team – has entered the Google Lunar X PRIZE. The latest rumor about the release of the Augustine Commission final report comes from the Huntsville Times. The fifth Ariane 5 of the year is poised to launch between 14:59 and 16:10 Phoenix time today, Thursday. Watch live launch coverage. Defense Advanced Research Projects Agency’s (DARPA) is working on a concept that replaces large satellites with clusters of wirelessly-linked modular spacecraft flying in loose formation has the potential to drive cultural change, Aviation Week reports. NASA has released a study of the Scientific work done at the International Space Station during its first eight years. Soyuz TMA-16, launched yesterday, is scheduled to reach the International Space Station tomorrow, Friday, 2 October 2009.